Engadget speculates that Samsung may be waiting for Gingerbread or Honeycomb, which certainly sounds like a fair assessment to me. 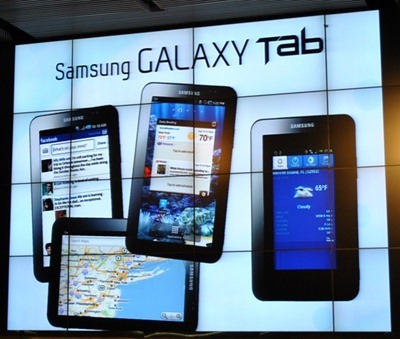 After all, Google recently said that Android 2.x isn't designed with tablets in mind, but Android 3.x would be. In any case, Samsung seems have hit their Android stride in the past few months, with some pretty high-profile, well reviewed, and highly successful product launches. Based on initial impressions, the Tab seems to be a decent piece of kit - and hopefully the 10" tablet keeps the trend going.